This is the best pelican picture I've managed. work to do to capture the perfect picture. While on vacation I've become a bit obsessed with pelicans. Every evening they fly by our balcony in groups. I don't really see them coming until they are there in lined formation. They float by one after another as they follow their regular path down the coast. Each day I've tried to capture a picture of them as they fly close to our balcony, but I'm never fast enough. The rest of my family thinks I have gone crazy. The people on the beach completely ignore them as they fly in formation in search of food. I can't ignore them as I find them absolutely fascinating. I've done a bit of research and was surprised to find they were quite endangered from the 1950s through the 1970s. They appear to be thriving now. I was also surprised to learn they live to nearly 25 years. Tonight's slice of poetry was inspired by observing them as they fly along the water in search of food. Here are a few haikus about these observations. Today I am joining the Slice of Life Challenge hosted at Two Writing Teachers. Stop by today's link up and join the conversation. For the next six weeks I am joining the CLMOOC. MOOCs are massive online learning communities. This one is offered by the Educator Innovator and powered by individuals from the The National Writing Project. It focuses on making and creating meaning through six weeks of collaborative make cycles. There is a focus for each week, a space to link up, and then ways to connect with others who are part of the project. I'm a little late to the party. It's been a busy couple of weeks. Today I'm squeezing in late to for make cycle 1: "unintroduce" myself. When thinking about an unintroduction, in only makes sense to think about an introduction: the pleasantness, the quick judgement, the basic information shared. For me, I always find the greatest challenge to remember the name which is always given first and then so much information follows. I decided to unintroduce myself in a poem. Poetry Friday: Who's Been Here? The last two weeks I have been working with the Columbus Area Writing Project at The Ohio State University. I have been sitting in the same classrooms I sat in years ago as an undergraduate and graduate student. As I look around I can't help but think about all of the amazing professors I had. During my days wandering the halls I can't help but wonder who has been here? What great ideas have been formed in these very spaces? 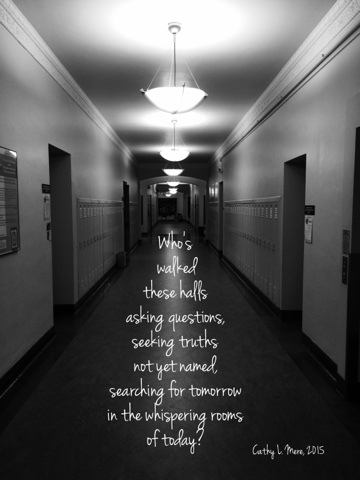 That thinking inspired this short poem with an image from Ramseyer Hall. It's Poetry Friday! Stop by Carol's Corner as Carol Wilcox hosts today's parade of wondrous words. 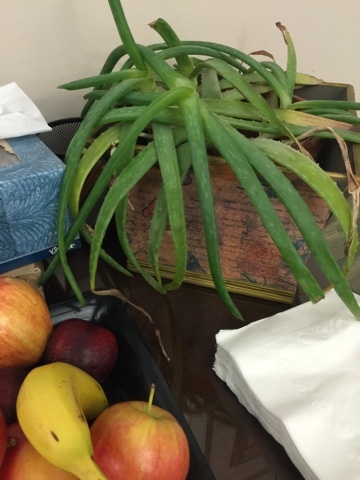 Today as I sat with our writing group, I noticed a plant sitting on the table - an aloe plant. That plant triggered a few memories of my grandma's healing magic. When I was a kid, I spent a lot of time at my grandma's house. She had a great location between the park and the pool with the ice cream shop just around the corner. Paradise! Not only did she have a great location, but she was a lot of fun. She was hip and cool for a grandma. She knew what music was hot. She stayed up past midnight and slept in until late into the morning. When I stayed at her house, we'd stay up all night playing cards and watching television. While Grandma was hip and cool and fun, she had some crazy ideas about first aid and health treatments. According to her, Vick's Vapor Rub was the only treatment for colds. Seven-Up over crushed ice was the only way to settle a stomach (might be true). When we would fall and scrape a knee or cut an elbow, we tried to not tell her because we knew what it meant...mercurochrome or merthiolate. They were both red liquids painted onto the cut. Ouch! One of them was incredibly painful and I always hoped when I saw the red stick she was using the gentler version. Grandma had one remedy I loved: her aloe plant. She had an aloe plant she kept in her kitchen. I was fascinated by it. Any time we would burn ourselves on something, she would tear off a piece of that plant and rub it on immediately. When she did this, I never got a blister and the pain was gone instantly. Magic! In my days with Grandma she told me a lot of stories, taught me a lot of games, and passed along many tips for solving problems. To this day, I count the secrets of the aloe plant as one of the best do-it-yourself remedies she ever shared. Grandma could heal about anything, but I'm not sure it was her do-it-yourself remedies that did it. I am quite sure Grandma healed everything with her hug, a kiss, and a little cookie. Today I am joining the Slice of Life Challenge hosted at Two Writing Teachers. I apologize for the lack of links, but we are out of data so I have to post from my phone. I will be back to add links. In the meantime, stop by twowritingteachers.com. It's Poetry Friday! Stop by A Year of Reading as Mary Lee hosts today's parade of wondrous words. 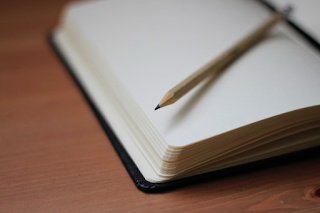 For most of my life, my writing has been for myself. It was somehow therapeutic to scratch words with a pen onto a piece of paper. My writing life has certainly ebbed and flowed --- mostly ebbed --- across the years, but writing for myself was always enough. I didn't have to worry about criticism. Didn't have to worry about saying things in the wrong way. Didn't have to worry about working and reworking my thoughts. I just put words on a page, closed the book, and walked away. A long series of events over the last ten years has slowly pushed me toward more public writing. One factor in changing my course has been community. Writing communities have pushed me to put more thought into my writing, to work toward creating stronger messages, to try writing in new ways, to be a bit braver when it comes to sharing the words on a page. Today, for example, this post is part of the collaborative work of the Slice of Life community. Every Tuesday these writers link up at Two Writing Teachers with a small snippet of story to share. Then participants comment and provide feedback on blogs that affirm, inspire and push the writing. I also participate in Poetry Friday which is another virtual community that supports one another's love of the written words of poetry. For the last two days, however, my writing community hasn't been virtual, it has been live and in person. A few months ago, Julie Johnson began organizing a group of educators to work together with the Columbus Area Writing Project on a project around digital literacy. I was honored to be asked to join, and absolutely thrilled when the group came together. The group members are educators I respect, trust to push my thinking, and know well enough to feel comfortable handing my writing to them. Our group consists of Tonya Buelow, Deb Frazier, Julie Johnson, Scott Jones, Deb Lairson, Mandy Robek, and myself. Today was only our second day, and already I am loving this writing community. Our day begins as part of a larger group as there are, I think, four different groups working on a writing project of one kind or another. We then have time to write, a working lunch (we need to read the pieces that will receive feedback), and then an afternoon of feedback. Our writing group does have a format, perhaps a protocol, it is following. We read the piece. One person provides feedback and cannot be interrupted. The writer responds to the feedback and asks further questions. Then the next person provides feedback. To be honest, I've never been a huge fan of protocols. No big surprise there for those who know me. I get their purpose, but sometimes think they feel constricting and keep conversation from flowing. There's something about learning in a group that is sitting around a table and having a natural conversation around something. There's something about the way the conversation grows that pushes our thinking, but protocols sometimes take the naturalness away from this. For some strange reason I can't explain, the boundaries of the protocol have made the conversation quite fun. If you knew our group, you'd know we are all a bunch of talkers. Watching us trying not to interrupt is hilarious. At times, someone just loses their ability to be quiet and interjects accidentally --- that is even funnier. Listening to the feedback, even when it is for someone else, has really helped me to think more about my writing. The questions we have been asking each other have been hard, but the conversations have been comfortable. Our writing group will be working together for the next two weeks. After reading the beginnings of each person's piece, I am curious to see where we will go as we work together. Most of all, I'm glad that in the middle of this hard work, I know we'll be able to laugh. Writing communities have helped me to grow as a writer. There's still much to learn and I'm glad to be working beside these writers in these next steps of my writing journey. It's Tuesday! Today I'm participating in the Slice of Challenge hosted each Tuesday at Two Writing Teachers. Stop by today's round-up and join the fun! Happy Poetry Friday. It seems the perfect day to celebrate poetry and portrait together. 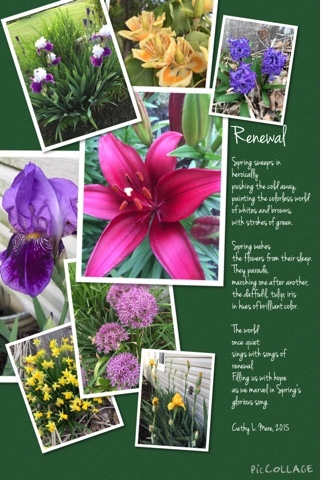 Each season, Carol Varsalona, creates a gallery of poetry and images for her readers. The idea of a virtual gallery is interesting to me. Carol is always thinking of smart ways to collect, collaborate, and curate digitally. Thankfully, she is also good at reminders. Here is my offering for her Spring Symphony gallery. I can't wait to take a walk through the collection. to change the images --- Mother Nature paints glorious pictures. It's Poetry Friday! Stop by Jama's Alphabet Soup for today's parade of wondrous words. I'm tired of being cold --- and, yes, I wrote this in June! This morning I am sitting on my couch curled up in the corner seat wrapped in a fleece jacket. Yes, it's June in Ohio, but I'm cold. I started on the patio because it was warmer outside than inside, but it started to rain so I had to come back into the house. I'm considering disconnecting the air conditioning. Do you think my family would notice? When you live in Ohio, you are cold from November until late March. You learn to live with it. You build fires in the fireplace, drink hot coffee, and make lots of soup. During these months, I tire of putting on coats, boots, scarves and mittens. I tire of sweaters and leggings under my dress pants. I tire of cold winds and icy conditions. Cold just becomes a way of life. My car doesn't like the cold either. It has a warning light when the temperature gets to 37 degrees fahrenheit. This always makes me laugh as 37 might be considered warm in January. We spend months in endless brown and white with temperatures well below 37. When the calendar turns to April I know I will soon find relief. You'd think that I could be warm in June when temperatures near the upper 70s and into the 80s, but in Ohio people love air conditioning. I'm convinced they love to keep houses and buildings as cold as the wintery days about which we complain. My husband, whom I love dearly, likes the house colder than I. I can't imagine why his mediterranean blood would like it so cold. I find myself putting on jackets, wearings shirts with sleeves, and keeping socks on my feet just to wander around our house. I've tried to find a warm spot, but our air conditioning is much too efficient. When I go to bed at night, I often have to turn on my side of the heated mattress pad just to get warm. All of this cold, makes it hard to dress to go anywhere. If you're going to be inside, you might as well reach into your fall clothes stack. You'll need pants, sleeves, and maybe a sweater to go just about anywhere. This, of course, is complicated if you plan to be inside and outside. Outside the temperature might be over eighty degrees, but inside feels like sixty. It's like living in a freezer. I'm cold everywhere. I keep a blanket on the couch in the summer. I have a jacket in my car, just in case. When I was younger my grandma was quite a fashionista. She wore pant suits of yellow, blue, and mint green. Even in the summer she would have on a long sleeved blouse and a suit jacket. I couldn't understand it. Wasn't she hot in those outfits? Now, I'm actually considering purchasing a few pant suits for summer. Maybe, like me, she was always cold in the summer. Maybe it's a genetic disease. Whatever it is, I'm tired of being cold in the summer. I just wish my fellow Ohioans could realize that summer is the time for us to store up enough warmth in our bones to last us through the long months of winter. I just wish I could convince everyone to keep their spaces just a bit above meat locker temperature. I just want to be warm. Today was the first day I could really take a minute to sit back and relax. It was beautiful here so I headed out to spend the day on my patio. The wind whistled through the trees as the birds sang songs of summer. The breeze continually carried white fluffy seeds (I think milkweed seeds) through the sky. I thought I'd try to write a poem to capture the image. It's Poetry Friday! Stop by Buffy's Blog for today's parade of wondrous words.